The Florida Panthers have traded Brandon Pirri to the Anaheim Ducks for a sixth round draft pick in the 2016 NHL Entry Draft. The 24-year-old from Toronto was drafted 59th overall by the Chicago Blackhawks in 2009 and was part of many trade rumours over the past while. According to reports, the Vancouver Canucks, New Jersey Devils, Edmonton Oilers, and New York Rangers were among the teams interested in his services. Pirri is currently out with a lower body injury after he crashed into the boards on Valentine’s Day and he was struggling to find a place in the deep Panthers roster. Pirri is a reasonably skilled shooter and he has a good deal of finish. In 52 games this season, he has 24 points. He averages 14:49 of ice time a game and has been good for 111 shots on goal thus far. In 157 career games with the Panthers and Blackhawks, he has 46 career goals and 29 assists. The Ducks will certainly use him as a depth acquisition and will have to work him into the lineup after the ankle injury. He’ll serve a purpose on special teams and in certain situations, with a natural ability at the centre position. Anaheim is deep down the middle right now, so Pirri may struggle to keep up his ice time. 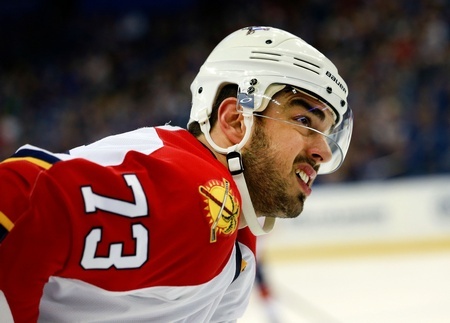 Florida signed Pirri to a two-year contract worth $1.85 million in July of 2014 and comes with a cap hit of $925,000. This deal is kind of a head-scratcher, as it looks like Pirri is moving from one team without room to another team without room. One wonders about Anaheim’s interest in such a pure centre, but one wonders more about Florida’s inability to get more for a guy who put up 22 goals last season and averages a shooting percentage of 13.5. The only logical answer is that it’s all about the green, with the Panthers hoping to clear space in order to make another move.